At Pushka we have a unique wooden egg holder which makes a wonderful housewarming gift idea for a couple or family. It is also suitable as personalised chef gifts for a couple that loves to cook in their kitchen, ideal as a unique Christmas gift, a personalised wedding gift, or as an unusual new home gift. 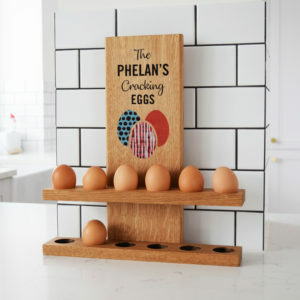 Our egg rack holder perfectly stores a dozen eggs in place and is made with solid oak by our master craftsmen. You can choose what name you want it personalised with and the colour you want the eggs motif to be. To view and find out more on our cool egg holder just click on the image below. This entry was posted in Personalised Gifts, Home Decor, Home Accessories and tagged home decor, personalised gifts, colourful decor ideas, personalised, wooden, creative, egg holder on 25th May 2018 by admin. You can make your room stir up subtle sophistication and modernity by layering grey tones and whites but you can also make colours pop out by mixing grey, neutrals and bright colours together. Grey tones are the moody shades of the moment and our grey striped ceramic mortice door knobs will help create vibe to any neutral interior in keeping with this trend. More than that we think grey and white are a classic timeless colour. Our ceramic mortice door knob style features a grey stripe design which will complement any grey and neutral tone. They are beautifully made from the finest hard wearing quality ceramic and are easy to fit. Simply click on the image below to view more on these chic mortice door knobs. We also sell similar white and grey candy striped ceramic cupboard knobs. This entry was posted in Home Decor, Home Accessories, Door Hardware and tagged home decor, mortice door knobs, fun, fun decor ideas, mortice, creative on 19th September 2016 by admin. Running for nearly 250 years, the Royal academy Summer Show is the most democratic art exhibition in the world. In an otherwise rarefied atmosphere of exclusive galleries and elitist auctions, the Summer Show invites submissions from the public to make up almost half of the annual exhibition. Students, hobbyists and people famous in other fields (this year Harry Hill and Una Stubbs) have their work submitted anonymously to a panel who, at breakneck speed whittle down some 12,000 hopefuls to the final selection of 400, to join the work of established, invited artists. Decoupage—the art of layering paper images onto a solid surface. Lord Byron was a fan and covered screens with images of another of his passions, bare knuckle boxing. Obviously not to everyone’s taste, but finding the images you like is part of the fun. The work is finished with layers of varnish, giving a warm, aged look, and giving the finished object strength, making it ideal for transforming furniture. Some of our vintage ceramic knobs would complement this style perfectly. Block Printing—easily available, and one of the easiest forms of printing, either on fabric or solid surfaces. Many blocks will be Indian, with some amazing paisley patterns, or simpler, repeating batik styles. For a nice first project, how about block printing a length of wood about 15cm wide as a back board for some of our lovely new coat hooks? Colouring In—don’t laugh, this is becoming a popular, therapeutic pastime for adults, and it works. If anyone has helped young children with their colouring books you will know how addictive this can be. And let’s face it, painting by numbers was always accepted by adults. Colouring in allows you to be far more creative, not being restricted to a colour guide. Good quality artist’s pencils are a joy to use, so get some key colours and a specialist colouring in book (check the Guardian newspaper who often run adult colouring in pages) and if anyone laughs at you doing it, give them a go, we guarantee they’ll get hooked too! Back to the RA Summer Show, this year for the first time all of the exhibition is available online via the RA’s exhibition explorer https://se.royalacademy.org.uk so those that can’t make it this year can still get inspired for a summer of creativity. This entry was posted in Personalised Gifts, Home Decor, Home Accessories and tagged creative knobs, creative hooks, personalised gifts, colourful decor ideas, colourful home decor, creative on 23rd June 2015 by admin. Upcycling is now a well-established way of reviving much loved items around the home. From some stunning examples of clothing being completely re-worked on the Great British Sewing Bee to much simpler, yet as effective upcycling like reviving a tired chest of drawers with a set of new handles. As with any idea that takes off (especially one that ends up with TV series devoted to it), there can be pitfalls for the unwary upcycler, and we hope that these simple guidelines will make the whole experience enjoyable for you. It is all very well seeing these amazing dressmakers on the Sewing Bee completely transforming an elderly overcoat into a stylish woman’s suit, but these talented amateurs regularly display a jaw-dropping level of skill that is beyond many experienced sewing hobbyists. So don’t worry if the thought of transforming an old pair of jeans into a baby’s romper suit fills you with dread, make some funky faded denim bunting for baby’s room instead. Just as enjoyable, and you can’t grow out of bunting! It will be far more satisfying finishing a small project than having a large one sitting, unfinished, in the corner, making you feel guilty. Especially to start with, keep your furniture projects reversible—paint can be rubbed down and changed, decoupage likewise. Cutting bits off can’t! Better still, drawer and door knobs can be changed and moved around, as can upcycled soft furnishings. With clothes, if they go wrong, there’s always smaller projects the cut fabric can be used for. As often repeated on the Antiques Roadshow, buy things that YOU like, not things you think others will, with half an eye on the re-sale value. Real upcycling is all about doing it yourself, for yourself. The added cost and labour involved will never really justify the price you could sell your finished work for. Buying ready upcycled goods is fine, but it is so much more fun and rewarding rubbing down, waxing or repainting a bargain piece of neglected furniture than buying a finished piece. The great joy of upcycling is that small luxury highlights will transform run of the mill items. A really stunning velvet collar for example, elevating a humble wool jacket, a set of vintage cupboard knobs updating an entire kitchen. Probably the most affordable and enjoyable makeover you could do this summer. This entry was posted in Home Decor, Home Accessories and tagged fun decor ideas, colourful decor ideas, creative, Pushka on 12th June 2015 by admin. If, like us, you are looking forward to the Great British Summertime, but are determined not to let our unpredictable weather get in the way, let us share with you some of our ideas, including using our knobs and accessories to bring the outdoors inside, enhancing and extending this wonderful season. The Chelsea Flower Show is always the first fanfare of the oncoming season, and this year provided some amazing inspiration. Dan Pearson’s Best in Show with semi wild planting of teasels, red Campion and buttercups against a magnificent backdrop of stone was a thoroughly deserved winner. Flowers of course have long been a favourite way to bring the outdoors inside, and one of our perennial favourites at Pushka Knobs is our set of six pastel ceramic flower drawer knobs, know with matching hooks. The other great way to get creative with flowers is to send us your favourite floral images—photographs, drawings or, best of all, pressed flowers, and we can create your own unique knobs, printed with your image. Of course, one of our favourite places to be on a glorious summer’s day is the seaside. This is also one of the most popular outside/inside motifs, but if the full driftwood, pebbles and seashells look is a bit too much we have some much subtler finishing touches. Our (currently reduced) striped mortice door knobs, are reminiscent of the smartest of deckchairs, and our pretty candy stripe cupboard knobs are a far healthier and longer lasting memento than a stick of rock! So if you are off to any of the great summer events—Wimbledon, Royal Ascot, Glastonbury, or one of the lesser known, but equally wonderful highlights of (Glastonbury aside) what used to be “The Season” (the Henley concerts and the Royal Academy show are both must-sees) have a great time, and let us know what inspires you. Otherwise, join the rest of us making a jug of fruit cup, grabbing a bowl of strawberries and enjoying the best bits from the comfort of our own homes. This entry was posted in Home Decor, Home Accessories and tagged creative knobs, creative hooks, colourful decor ideas, colourful home decor, creative on 1st June 2015 by admin. 3:27 Saturday morning. Go on dad, it really is your turn this time. REALLY! Blurry eyed, still half asleep, and just the tiniest bit groggy from that one last glass of Pinotage—well it was Friday night after all, but babies are no respecters of even the mildest hangover! Into the nursery and it becomes immediately obvious that a nappy change is required. Groggy quickly turns to grumpy, but a man’s got to do what a man’s got to do. Baby up on the changing mat and she giggles at you. The mood lifts a little. Then, going for the fresh nappy you spot the drawer handles—her footprint taken just hours after she was born. It is tiny, and in that moment you realise, in just a few short weeks, how this adorable addition to your life has changed and grown. The grey fug lifts, and job done, you snuggle into one another. Baby settles back down in her cot and you stay there, just being close. 6:30—what’s going on? Half an hour past her normally regular as clockwork morning feed, and the other side of the bed is empty. Up you get and quietly cross to the nursery. There, two blissfully sleeping bodies, dad on the floor with one arm in the cot, and baby with one of his fingers firmly grasped in her tiny little fist. Go on, make the most of the moment, straight back to the still warm bed for a well-deserved lie-in! Have you captured some of these precious moments and don’t know what to do with them? 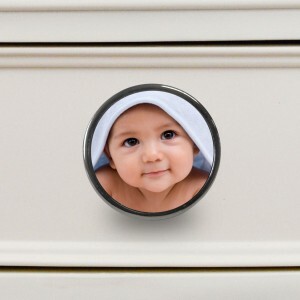 Instead of allowing those hand or foot prints, first tooth grins, and other landmarks in your baby’s progress to languish inside a drawer make them a feature on the outside. Use our bespoke service to create a unique and affordable way to display these wonderful mementoes. This entry was posted in Personalised Gifts, Home Decor, Home Accessories and tagged cupboard knobs, creative knobs, home decor, personalised, cupboard door knobs, creative, custom on 20th May 2015 by admin.